In Winter 2017/2018, gallupARTS offered a 3-part FREE Business Management Workshop series for artists. This program served 72 artists total, going a long ways toward fostering entrepreneurship in Gallup’s creative sector. 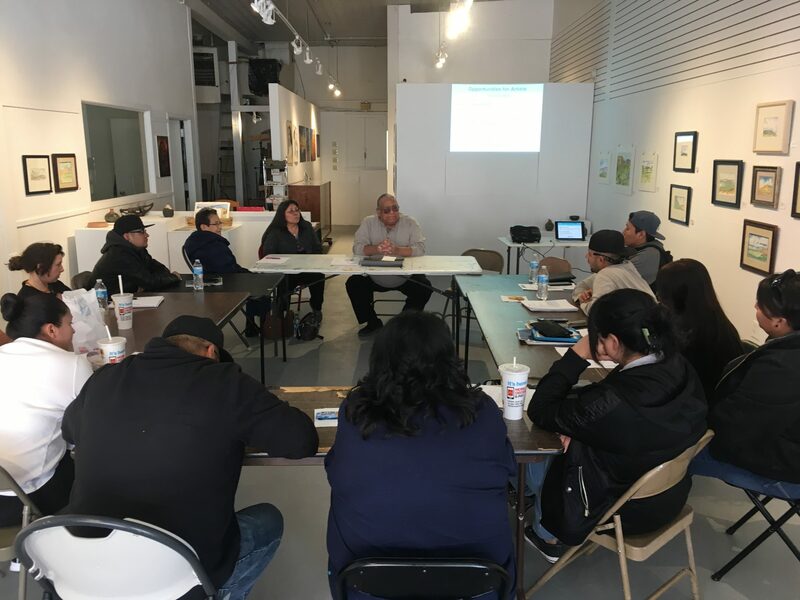 On November 3, 2017 gallupARTS hosted is first Artist Business Management Workshop in partnership with New Mexico Arts and the Gallup Small Business Development Center. Twenty-five artists attended and gained–in their words–“valuable,” “interesting,” “exciting,” and “inspiring” information from artist Maggie Hanley on how to build a clientele, price and market artwork, and make online sales. One artist said that after 15 years, this workshop has “put me on the path of success.” Wow! See pictures of the event below. On January 13, 2018 gallupARTS hosted is second Artist Business Management Workshop at the Navajo Tech Innovation Center. Thirty-two artists–weavers, painters, silversmiths, fashion designers, flower designers–gathered from as far away as Rio Rancho, NM and Flagstaff, AZ, from across McKinley County, from Tohatchi to Iyanbito, and from Gallup to get tips and tricks from renowned Navajo painters Bahe Whitethorne Sr. and Jr. Attendees described what they learned as “relevant,” “salient,” “informational,” “motivating,” and “meaningful”. See pictures of the event below. Bahe Whitethorne, Jr. brings artists in attendance up to speed on artist-friendly business technologies. Bahe Whitethorne Sr. presents lessons learned from a lifelong art career. “You have to first make the decision to do it,” he says. “Hands are an extension of hearts.” – Bahe Whitethorne Jr.
On February 28, 2018, gallupARTS hosted its third and final workshop in the series. Presented by renowned painter and silversmith Tedd y Draper, Jr. this roundtable discussion focused on setting up shop, taxes, inventory and more pro tips. Fifteen artists left inspired and motivated to strike out on their own! Download a comprehensive list of artist business management resources from Pave (Program in Arts Entrepreneurship) here.